Reading a food label can be a hard and overwhelming challenge. 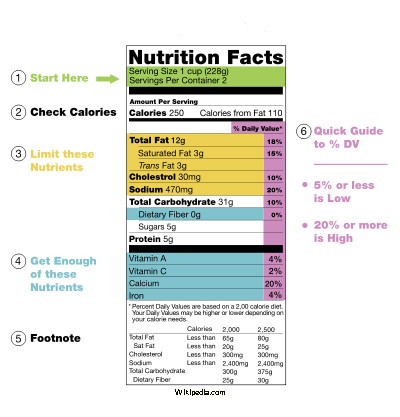 Nutrition labels are so important because they provide you with a detailed look of what is inside the food you are consuming. Don’t worry because you can easily learn important things to look at when reading a label to food you are about to buy or eat. Serving Size– provides you with a quantity telling you how much of this food is equal to one serving (for example 1/2 one cup = one serving). The serving size influences the number of calories and nutrients you are taking in with each serving you consume. By taking note of the serving size you can compare that to how much you actually ate in order to know exactly how much you are consuming. Calories– provide a measure of how much energy you get from a serving of a particular food. The key is to find nutrient dense foods. Meaning, eating a food that is packed with nutrients without being too high in calories. This also means that you want to try to limit the amount of “empty calories” you take in. Empty calories are ones that do not provide you with any or a very small amount of nutrients and are high in calories. By having an understanding of the serving size and calorie section of the label can help you manage your weight. Nutrients to limit (such as total fat, saturated fat, trans fat, cholesterol, and sodium) By limiting the foods you eat that are high fat, cholesterol, and sodium you are really helping your body reduce it’s risk of disease and helping promote weight loss or weight maintenance. Nutrients you want to make sure you consume enough of (like dietary fiber, vitamin A, vitamin C, calcium, and iron all in which are common nutrients most Americans do not consume enough of). Simply put, these nutrients provide great benefits for your body and are required in order for your body to function properly. Ingredients-gives you a running list of which items went into making the food you are about to eat. Ingredients are listed in order according to how much of the ingredient the food contains. An important thing to remember is, if you can not pronounce an ingredient listed, then you should probably avoid it! If you look at a food label you might say there is more information on it that wasn’t explained here. If your food does not have a label (like fresh produce), use a free resource like CalorieKing.com or use a food scale. The point is to start small, begin at the basics and once you understand this you can build on our knowledge. I want you to not feel overwhelmed and realize you can read and understand the food you are about to eat. I agree with Noaa, Kinseys ideas simplify eating and shopping the correct way! What’s the difference between all the different kinds of fiber on a nutrition label? Thank you Noaa and Ann! I really appreciate your kind words. Great question Steve. Dietary fiber is listed on the food label when that food is derived from plants (dietary fibers are the structural part of plants). On the food label it may be further broken down into two groups: soluble fiber and insoluble fiber. Soluble fibers are those items that dissolve in water forming a thicken gel that’s easily digested. Think of oatmeal…with cooked oatmeal takes on this thick gel like consistency. This type of fiber helps protect against disease and cancer, so try to eat items providing a significant source of soluble fiber! Insoluble fiber, on the other hand, does not dissolve in water therefore it does not form a gel. However, this type of fiber helps your body by promoting healthy bowel function making you go to the bathroom more regularly. So, in short…fiber works wonders in your body! I hope that helps Steve! I’m trying to get healthier with my diet and this website is wonderful for that!! !